An international bank with over 80,000 employees and 16 million clients worldwide recognized an increased need for organizational change management capability. The volume and pace of large-scale change drove the need for this bank to be more purposeful and more consistent at achieving return on key strategic investments. Senior executives set a mandate to execute on change in a more structured way, and in early 2011, an Organizational Effectiveness (OE) team was commissioned to determine a plan and a strategy. “Change can be managed in both formal and informal ways, each producing a different degree of success. Our experience, and a key driver of our success in this discipline, is the fact that we have implemented a structured and purposeful approach for managing the people risks associated with change. It enables consistency, repeatability and sustainability, all of which are important to long-term success. To establish change management as a core capability within a large, complex, diverse and global financial institution. In a deliberate process that spanned 18 months, the OE Center of Excellence also worked to align Prosci’s change approach with the mature program framework already in place at the bank. In 2012, the group began by layering change methodology and activities next to their formal project methodology. They provided clarity about how change management fits into the structure of a project, including setting trigger points to initiate change work on large-impact projects and establishing clear ownership of specific roles and activities for change resources. This international bank’s story of an intentional change management capability build across a global enterprise has produced many of the outcomes that the OE Center of Excellence was originally commissioned to create. The organization today has a solid change management foundation and internal practice. 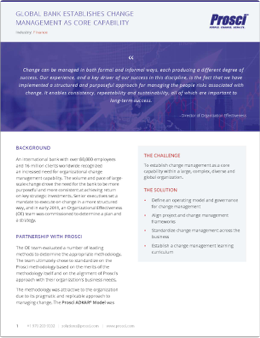 Learn how this global bank leveraged executive sponsorship and enterprise-wide competency building to expediate its change management growth, and learn what other results it has seen from building a change management capability, when you download the full story as a PDF. An international bank with over 80,000 employees and 16 million clients worldwide recognized an increased need for organizational change management capability. Read how the bank's Organizational Effectiveness team built organizational change competency.